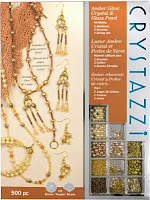 See our new selection of Creative Studio Art Kits in the Paint & Draw Art Kits section of the store! Faber-Castell's Creative Studio line features quality art materials and instruction for getting started in a variety of art mediums. Faber-Castell is one of the world's leading manufacturers of quality art supplies, a brand name you can trust to deliver premium products at affordable prices. Perfect for aspiring artists! 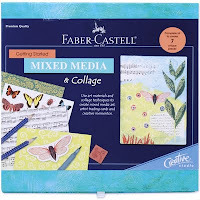 The Getting Started Mixed Media & Collage Kit is an ideal starter kit for learning about mixed media art. Mixed media collage combines interesting textures, papers, and stamping techniques to create unique & beautiful works of art. 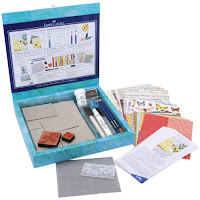 This complete beginner art kit includes 2 ART GRIP aquarelle pencils, 1 PITT artist brush pen, 7 greyboard work surfaces, 20 sheets assorted design paper, white gesso, white craft glue, foam brush, lace, plastic mesh screen, sepia stamp pad, 2 rubber stamps, and pencil sharpener. The 12 fully illustrated instruction cards teach the basics of layering, stamping, and watercolor pencil. You'll learn how to create interesting textures and make your own artist trading cards. Use mixed media collage techniques to turn special mementos into beautiful keepsake art. This is a creative art gift to give anyone wanting to expand their knowledge of mixed media & collage techniques! 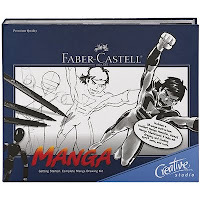 The Getting Started Manga Drawing Kit is a Creative Studio beginner art kit from Faber-Castell. Manga is an artistic style of drawing popular in Japanese comic books. You can learn how to draw manga characters and scenes with this complete beginner drawing kit. Kit includes a manga sketchpad, manga stencil, manga mannekin, black PITT artist brush pen, grey PITT artist brush pen, superfine black PITT artist pen, Faber-Castell graphite HB pencil, pencil sharpener, and eraser. The 28-page illustrated manga instruction booklet will teach you how to draw manga characters and backgrounds. This is the perfect gift for anyone interested in creating manga style art! 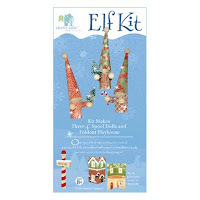 Visit the Paint & Draw Art Kits section for details on these getting started art kits and to see our complete selection of art kits for beginners! Explore a variety of creative art kits at Weekend Kits and be ready to paint & draw on your next Weekend at Home! We have new Wedding Scrapbook Kits to share with you today. Sharing your engagement and wedding day memories is easy with complete album kits that include everything you need to get started. 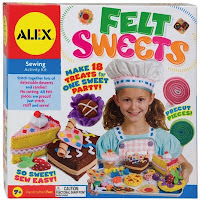 You can find them in the Scrapbook Kits section of the store! 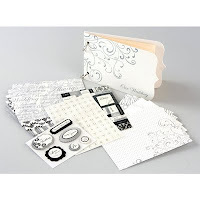 Capture pre-wedding day events with the Bride to Be Engagement Scrapbook Kit from K&Company. 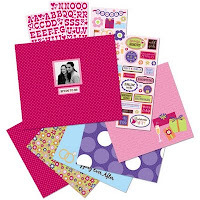 This fun scrapbook kit includes a pink polka dot album, coordinated papers, and embellishments. The 8-1/2" x 8-1/2" post bound album includes 10 top-loading page protectors and a photo window frame on the cover. 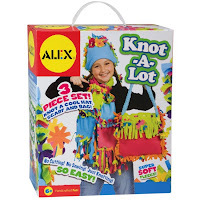 This is the perfect scrapbook kit for sharing all of those fun engagement photos with best friends, family, and fiance. Celebrate special events, like the day you went shopping for your wedding dress, your wedding shower, the rehearsal dinner, and more! 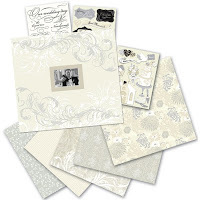 The Classic Wedding Scrapbook Kit from K&Company is perfect for sharing photos from your wedding day. This wedding scrapbook kit includes a 12" x 12" post bound album and 10 top-loading page protectors. All papers are acid-free and photo safe. The embossed album cover uses traditional white & ivory tones with a silver foil scroll design and includes a photo window frame. Kit includes 10 designer papers, 10 grand adhesion stickers, 24 die-cut stickers, 1 sheet of rub-ons, 18 clearly yours stickers, 15 assorted gems, and 2 types of ribbons! The I Do Wedding Mini Book Kit from Making Memories includes a 5" x 7" spiral bound mini scrapbook, 10 card stock pages, 12 designer papers, an assortment of stickers, and rub-ons. Mini albums are a convenient way to share wedding day photos with family & friends while on the go. It's easy to take along a mini scrapbook album! Mini scrapbooks are also a thoughtful gift to give the bride or bride's family. 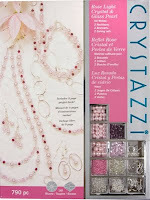 You'll need scrapbooking adhesives to adhere photos, papers, and other embellishments to your scrapbook pages. Scotch Photo Splits are double-sided and photo safe. Scotch Scrapbooking Tape also works well. You'll find a variety of adhesives available in scrapbook stores. Tape runners and adhesive dots are also popular options. Try a few different types to find the one you prefer. Just remember to always choose a scrapbooking adhesive or tape that is labeled as photo safe. 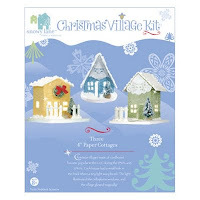 Visit the Scrapbook Kits section to see our complete selection of scrapbook kits! 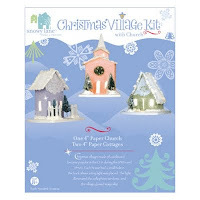 Scrapbook album kits are ideal for beginners just getting started in scrapbooking. 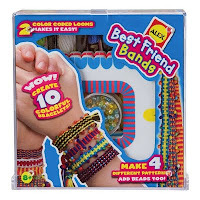 They're also a convenient option for experienced crafters. Everything is perfectly coordinated to match in both style and color. All you need are a few supplies and you're ready to start scrapbooking. Scrapbook kits make it easy to capture memorable occasions in beautiful keepsake albums. Visit Weekend Kits today and be ready to create your wedding day scrapbook album on your next Weekend at Home!